As a BMX-crazy kid, I spent countless hours in the woods launching off simple ramps. It was pre-helmet era and jeans for pedaling were just fine, thank you very much. 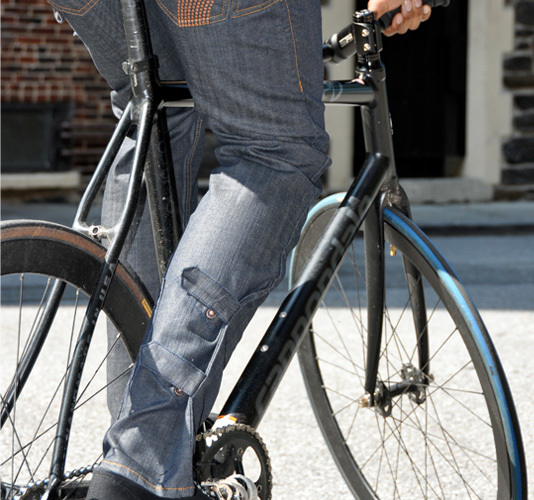 Now, more than 25 years later — after too many years of lycra-only cycling — jeans for pedaling are back. One pair I’ve been testing as of late, Osloh’s Pedal model, are built from a stretchy denim hybrid with 98 percent cotton and 2 percent spandex. The fabric is anti-bacterial, odor resistant and coated with a water-repellent resin. Complete with a chamois-like pad, they’re comfortable to ride in. The $129 jeans have snap leg adjustment straps on the drive-side leg so your pant won’t snag in the chain. There’s a quilted reinforcement on that right leg, too. This one-two punch was effective at keeping the jeans out off my drivetrain for months. A button fly, adjustable waistband snaps, a hidden stash key pocket, a reinforced U-lock strap above the back left pocket, and zippered back pockets round out the pant. In my time so far, the $129 pants have held up to many back-to-back days of riding. They don’t look worse for the wear, either. The buttoned-down cellphone side pocket? It’s perfectly placed. It does not put pressure on a cell phone, which translates to minimal ghost-dialing. 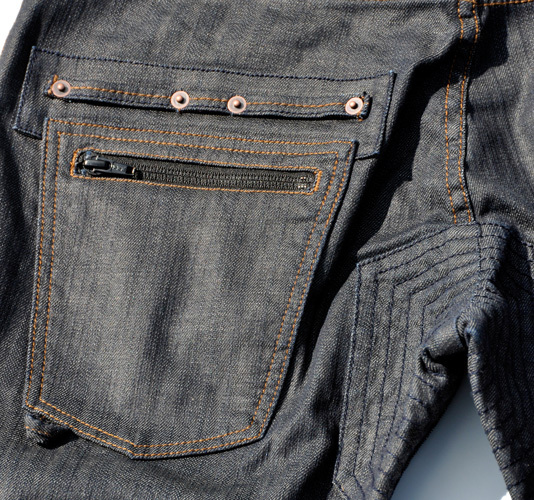 The left pocket on the Osloh Pedal is deep and includes a zipper. Put them on and you’ll be surprised how low the back pockets are. Before getting on the bike, I thought that was for aesthetics. Wrong. Turns out even George Castanza’s thick wallet could fit in there comfortably. Moving these pockets a little lower alleviates the pressure on the back pocket. There’s one drawback to this pocket setup, though it’s non-cycling related: The rivets on the pockets can dig into whatever you’re sitting on if you’re not sitting perfectly straight up on a bench or chair. Size-wise, they’re spot on and the fit that’s advertised as “slim, relaxed comfort” is also accurate. The Pedal compares well to other cycling pants on the market I have tested and reviewed. —Stephen Krcmar lives, works and dreams about his old Mongoose BMX bike in Mammoth Lakes, Calif.